I'm excited to be attending the National Book Awards ceremony this Wednesday evening in New York City, along with a few other bloggers who will be providing reports in formats ranging from high-tech real-time (that's Ed) to low-tech whenever-I-get-around-to-it time (that's me). I'll be dressing up for the occasion (which proves that I'm excited, because it takes a lot to get me to dress up) and I'll be rooting for David Kirby's The House on Boulevard Street to win the poetry award and Denis Johnson's Tree of Smoke to win the fiction award. The well-reviewed Tree of Smoke has been generating a bit of backlash lately. Karen Karbo cited the thick 624-pager to Galley Cat as an example of "brick-lit", and Otto Penzler refers to it in the New York Sun as "impenetrable, disjointed, confusing, structurally inept, and filled with characters as well-defined as phantasms". This puts me in a funny position, because I'm usually all too eager to pile on the hate when a long and incomprehensible novel is over-praised, and yet I am not having a similar experience at all with Tree of Smoke (though I must confess that I have still not finished the book). The plot is easy enough to follow, the prose is clear and unpretentious, and the author's compassion for his characters gives the stark war story an uncanny human glow. I have never liked a Denis Johnson book before, not even his slim Jesus's Son, which felt a little too stylishly "heroin-chic" for my tastes. I might have never persevered with Tree of Smoke if it weren't for the knockout scene at the very beginning of the book, which I like so much that it's a pleasure to type it in full here. This is our introduction to the book's hero, Seaman William Houston, who is wandering alone through a jungle looking to shoot a wild boar. Seam Houston felt his own stomach tear itself in two. "Jesus Christ!" he shouted at the monkey, as if it might do something about its embarrassing and hateful condition. He thought his head would explode, if the forenoon kept burning into the jungle all around him and the gulls kept screaming and the monkey kept regarding its surroundings carefully, moving its head and black eyes from side to side like someone following the progress of some kind of conversation, some kind of debate, some kind of struggle that the jungle -- the morning -- the moment -- was having with itself. Seaman Houston walked over to the monkey and laid the rifle down beside it and lifted the animal up in his two hands, holding its buttocks in one and cradling its head with the other. With fascination, then with revulsion, he realized that the monkey as crying. Its breath came out in sobs, and tears welled out of its eyes when it blinked. It looked here and there, appearing no more interested in him than in anything else it might be seeing. "Hey," Houston said, but the monkey didn't seem to hear. As he held the animal in his hand, its heart stopped beating. He gave it a shake, but he knew it was useless. He felt as if everything was all his fault, and with no one around to know about it, he let himself cry like a child. He was eighteen years old. There is so much that moves me in this sequence: the believability of the detail (the monkey's "meager back", the belly expanding like a balloon), the spooky anthropomorphism as the soldier cradles the monkey like a baby, the complete pointlessness of the violence. This is my idea of the kind of strong opener a writer needs to produce if he or she wants to motivate readers to stick with a 624-page novel. It sure worked for me. 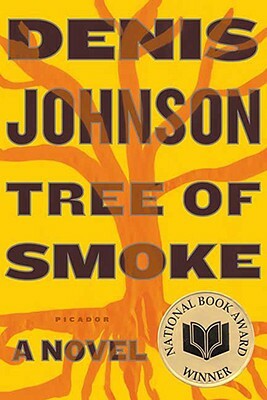 4 Responses to "Tree of Smoke: Denis Johnson’s Signifying Monkey"
nationizing artYes, I understand it's the National book award. It's their award, their entity. But...books and writing aren't national. You don't have to be born in a certain planet spot to be a writer. Thus, I object to awards for American citizens published in the US. In fact I object to the concept of citizenship. How do we get beyond that when art is nationalistic? It would greatly help, not hurt, this book group to acknowledge the best works written by earthlings. WellI could have done without all that, for sure. But at least I know never, ever, ever to read that book. An awards ceremony about books... it tries to sound interesting, through no lack of effort on your part, but it seems a bit like a mini-series about concrete to me. And I'm pretty sure Diddy isn't going to show up at the event or at the after party. Although if he did, I bet more people would pay attention. I really think only acknowledging the best works written by earthlings discriminates against authors from Mars, dude. Let's not planetize art. Done with JohnsonYeah, Jesus Son didn't do anything for me either. I don't understand the hype that book got. Denis Johnson and I are done. Just like Chuck Dickens and I are done. I won't miss either of them.